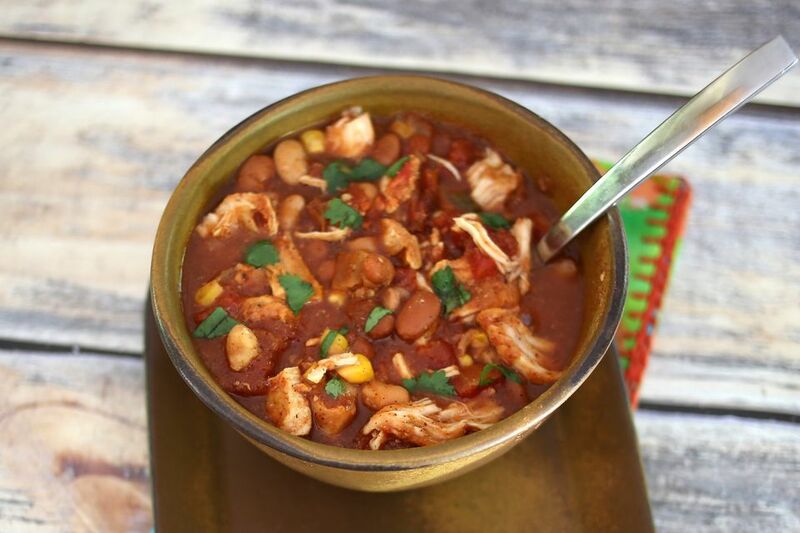 This chicken chili makes an excellent dinner on a cold fall or winter evening, but you don't have to wait for the cold weather to enjoy it. Make it any time of the year. Besides the great flavor, the stew is a fast preparation, and it cooks in under 25 minutes. Cubed boneless chicken breasts or tenderloins are the protein in the stew along with the beans. Tomatoes, garlic, onions, a jalapeño pepper, and some corn provide the color and flavor. Feel free to tailor the ingredients to suit your taste. For extra color and texture try a combination of white beans and black beans or small red beans. Or use zesty chili-seasoned tomatoes or fire-roasted tomatoes in the dish instead of plain diced tomatoes. Feel free to add one or two chopped sweet bell peppers—a combination of red, green, and yellow—to the skillet when you add the chicken. If you crave more heat in your chili, use two jalapeno peppers or add about 1/4 to 1/2 teaspoon of crushed red pepper flakes and a pinch of cayenne pepper. Serve the stew with freshly baked cornbread and a simple salad for a delicious and easy family meal. Pat the chicken dry and then cut it into bite-sized cubes. Set aside. Peel the onions and chop them. Heat the olive oil in a large nonstick saucepan over medium-high heat. When the olive oil is hot and shimmering, add the chopped onion and minced garlic; saute for about 3 to 4 minutes, or until the onion begins to brown. Add the cubed chicken to the onion and cook for about 4 to 6 minutes, or until lightly browned on all sides, stirring frequently. A add the chopped jalapeno, coriander, cumin, diced tomatoes, and beans. Juice the lime and add it to the stew along with the corn kernels. Cook for 5 to 10 minutes longer, stirring occasionally. Serve the chicken chili with sour cream, chopped red onion, and chopped cilantro. If desired, garnish with shredded cheese.